Getting older is like walking down a leaf-lined trail in the woods. Once you’ve gone a ways, you can look back and see where you’ve come from. At least some of the turns start to make sense and you can appreciate with new eyes the wonder of what lies around you. You can also start to notice themes throughout your journey. On a walk in the woods, it might be how maple leaves always catch your attention, the frequent scurrying of squirrel paws or the chirp of a certain bird. On the journey of life, it may be the things that have stuck with you through the years, the things that you’re drawn to, the things you love. Take my Grandpa’s life for instance. After this Nebraska-born man joined the Navy in his teens, everything Navy has held a special place in his heart. First, the Navy itself, then lighthouses, now restoring and building model ships have kept the nautical lines strong in his life. They also extend into something else Grandpa loves. “I would have thrown it away if you hadn’t taken it,” the jolly old blacksmith told Grandpa as they admired the five-foot, restored pond yacht. The boat had been the blacksmith’s childhood toy but needed some serious repair after being damaged in a tornado and neglected for years. After discovering how much Grandpa likes all things ship related, the blacksmith offered him the boat. Grandpa took on the project and went to work, scraping paint and repainting, studying historic information, crafting new parts, even tying the rat lines himself. After hundreds of hours of labor, the pond yacht was ready, and, oh, is she a beauty now. She represents one of the other things Grandpa loves: fixing things and giving them a new start on life. It makes me think of how God takes on the wreckage of our lives and makes us ready to sail again. Yet another of Grandpa’s loves is making people laugh. He’s the one you can always count on to tell a joke. But he can tell it with such a straight face, you might take him seriously if you’re not on your toes! Along with that, he also loves marshmallows and pecan pie and really has such a sweet tooth, we don’t know how he gets by. Maybe it’s because he’s disciplined in other areas of his life. Grandpa’s the one who walked miles in a frozen January when he needed to get in shape. That’s partly why he could walk himself out of the hospital a day after having a hip replacement! He’s also the one who is ready to leave to work ten minutes early. (I know because we used to work together.) All his life – from his job at the brickyard when he was sixteen through now – he’s been willing to put in a good day’s work and do things well. He’s also ready to learn new things (like with the ship models). We know he’ll never really retire until he simply can’t work anymore. You could say work is a love of his, too, though he might not admit it. I think this has been an example to the rest of his family. But more than ships, lighthouses, repairing old things, jokes, marshmallows, and the satisfaction and pride of a job well done, Grandpa has another love: his family – his wife of 58 years, his children and his grandchildren, his brothers and sisters. Sure, our family isn’t perfect, and I think Grandpa would say he’d do some things differently if he could now, but when push comes to shove, we know Grandpa loves us. And that really counts for something because there’s a big difference between pouring time into boats and knots and work and pouring your life into people. All those other things are good and can be used in wonderful ways, but people are eternal. Someday Grandpa will leave those other loves – just like you leave the trees, the squirrels and the bird songs when you leave the woods – but those people he loves on can, by God’s grace, stick with him through eternity. How awesome is that? I know I’m grateful for the “loves” of Grandpa’s life. 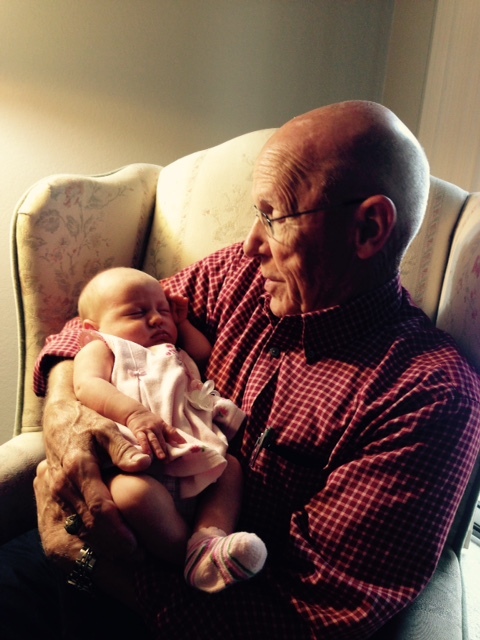 They will be a part of the “Grandpa” stories my family will enjoy getting to share with his newest little love – his great-granddaughter. Happy Birthday, Grandpa! I’m glad to say you are one of my “loves”. What about you? What are the “loves” of your life? Are your priorities where you want them to be? It’s not too late to change course and set sail for a different sea. Not so long ago in a land not too far away, there lived a little girl named Ruthie. She lived on a farm with her father, mother and sisters. They didn’t have much in the way of things, but they were surrounded by generally kind neighbors. Ruthie relished the parties for birthdays and the celebrations for national holidays. She also cared for the neighbors’ children when a helping hand was needed. Along the way, one thing was for sure: Ruthie learned to love people. As Ruthie grew up, she discovered another love: music. Finally, she had the opportunity to take a handful of music lessons. That gave her the courage to play both the piano and organ for church! While she loved people and music, Ruthie also enjoyed time by herself. She didn’t even mind being the one to stay home and clean! (Every family needs a little Dutch-ness, perhaps?) However, she also enjoyed a good story. Her family didn’t have many books, but she read The Best Loved Poems of the American People. Perhaps the rhythm of the words struck a chord with her music-loving heart. At any rate, she kept that book for decades to come. Even after grown-up Ruth left her small hometown, her partialities perpetuated. People, pianos and poems continued to be parts of her life. She also carried sweet memories with her. Remember those parties with the neighbors? Ruth couldn’t help but share the stories, especially about the pies! Mrs. Cacak always baked such wonderful pies! As Ruth traveled far and wide, maybe pie became like a taste of home. Lo and behold, one day Ruth found that she had become a grandma! Where had the years gone? Well, whether on purpose or not, Ruth passed down her partialities to the next generation. She showered the new little people in her life with love and showed them how to love other children. Once they started taking piano lessons, she played and sang along, imparting her interest in hymns. She shared her book of poems. And, lastly, she offered the stories of her childhood, including the palate-pleasing pies. Have you ever wondered over how God weaves our lives together? Isn’t it amazing how He even carries on the work from generation to generation? I think Ruth’s story is a good illustration. You see, I am one of Ruth’s granddaughters. Her passed-down partialities have had a huge impact on my life. I hope to carry on her love for people, especially children. If she hadn’t played piano in church, I might not have either! It was with her Best Loved Poems of the American People that I spent happy hours, and now I post about poems on my blog. And if she hadn’t shared sweet memories with me, I may not have been as inspired to bake pies a-plenty. This is why younger people like me need older people like my grandma. They give us perspective and pass down passions and pastimes. And, from what I’ve seen, older folks need us young chicks to remind them that their decisions affect others and they need to be thoughtful about what they value. Certainly, there are many other things – even beginning with “p” – that Grandma could have invested in and that could have made my life much different. So if you’re an older person, please consider your ways well and seek out someone with whom to share your gifts. And if you’re a younger person, watch for what you can learn from the older people in your life. Won’t it be wonderful to see what God’s masterpiece looks like someday when we get to see His woven work? Thank you, Grandma, for passing down these things to me. 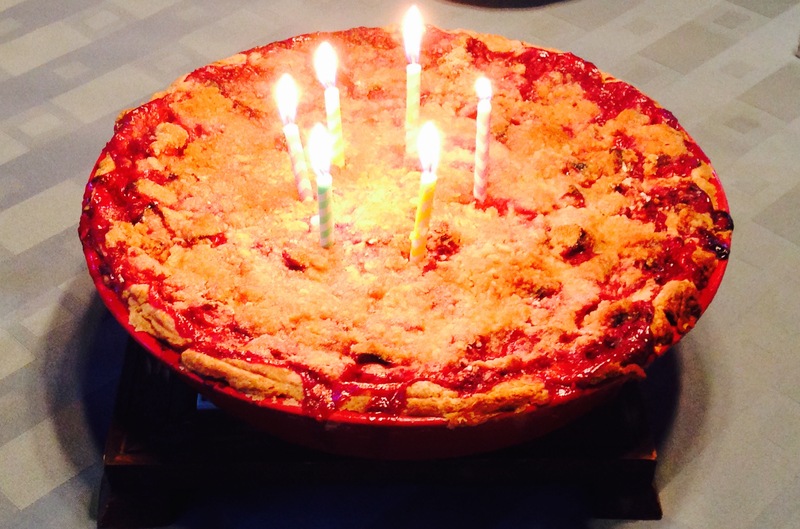 I’m glad you enjoyed the cherry and raspberry pie I was able to make for your birthday! You know the secret ingredient, don’t you? Love.